The army of Charles the Bold, the ill fated last Duke of Burgundy is a fascinating subject, in the early years of the 1470's he created a regular army similar to that of France and the Italian city states through a series of ordinances which detailed the organization, equipment and training of it' s soldiers. On paper it was a most impressive force combining "native" troops such a Burgundian gendarmes, Picard archers and Flemish pikemen with German, English and Italian mercenaries and it was supported by the largest and most modern gunpowder artillery train in Europe. And still it failed disastrously in the Swiss war of 1476-1477 for reasons that have yet to be fully explained and explored by the historians. The Burgundian army left behind a wealth of documents including the ordinances, a treasure trove which allows a rare and surprisingly detailed look at how a late medieval army was organised and equipped. However at time sit not easy to fully decipher the meaning of the texts. I've struck one such problem in the the ordinance of Bohain en Vermandois, laid down on janurary 13th 1472. This ordinance provide a detailed description of the equipment the Burgundian infantry was to posses, including the pikemen which is my personal interest. The pikeman must wear a sleeved jacket reinforced with plates , and a breastplate. His right arm should be protected by more plate armour, and his left army by a targe (a small round shield). Since he would need both hands free to wield his weapon the targe may have been fastened to his arm. I've attached two images of recreated Burgundian pikemen below, it' fairly obvious that Breckon has looked at Embleton's earlier image and then added details based interpretation of the ordinance text. The jack ("jacket") and it's plate reinforcements are fairly easy to visualize as is the breastplate. It's " right arm should be protected by more plate armour..." part and the targe which is causing me problems. While it makes perfect sense to increase the armour on the right arm as it is the most exposed limb, I'm a bit at a loss at to which kind of armour would be/could be worn over a thick multi-layer jack sleeve and the jack chain? A gauntlet would protect the hand and part of the lower arm and there are several "long" gauntlets which covers the lower arm almost all the way to the elbow shown in German artwork of the period. The targe raise other interesting questions. How was it held? Was it attached to the arm as the author suggests in order to free up the left hand for gripping the pike? How was it used in a fight? 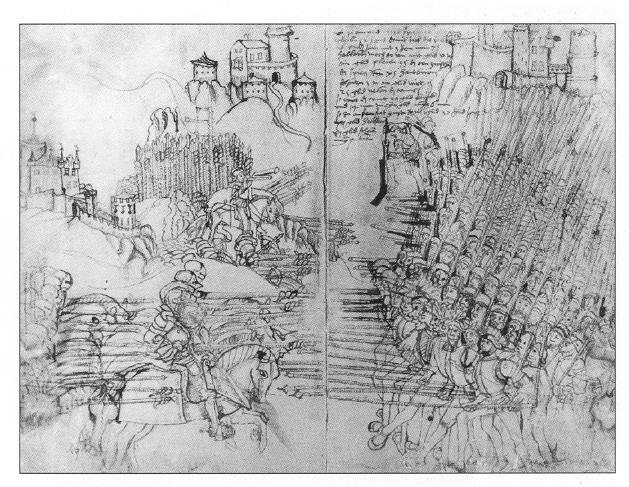 It seems to me that there is a possibility of it getting in the way while one is using the pike in massed formation while it doesn't seem to add much in the way of protection. I'll would be grateful for any and all help with answering these questions. If a plate armour is present on the right arm, why would there be any jack chain on that arm? Maybe the "more plate on right arm" is not suggesting that you should add another peice of armour over the jackchains, just saying that the right arm should allways be more protected than the left? So if you have just the jack-cloth-protection on the left you should add chains to the right, and if you have jackchains on the left one should have plate on the right. Just as some equestrian armour has its bridle-side heavier and reinforced on the left side where the lance hits. Just my first thought..
http://www.lanceandlongbow.com/lls_publications.html although it is £15 so I would want to know more content details before ordering if it were me. I myself would prefer having both arms equally protected being lefthanded and close to ambidextrous. I could feel comfortable with one arm only being armoured if the other arm was already protected by a shield ...... maybe. I could also see having one arm only armoured if that was all I could afford financially or if being as lightly armoured as possible was an advantage if priority was given to agility and endurance if a lot of running expected: An extra 5 pounds of armour could slow you down if a battle became an endurance match ? With a pikeman with NO shield and maybe only a small buckler to go with a sword as secondary weapons the non-dominant arm could be as vulnerable as the strong side arm depending on technique and on the unpredictability of a fight. In formation the right arm might be more at risk, but in a looser formation or if the secondary weapons were being used both arms would seem to me equally in need of protection ? I could be wrong and any arguments for the armouring advantages of only one arm I would find interesting. I have that two booklet set, good on flags and heraldry and army composition and provides a short history of Charles the bold's wars but does not go further than the Osprey as far as equipment is concerned. A good question, I interpret the text that way because it states that "more" plate armour is to be worn on the right arm, suggesting to me that plate armour in the shape of jack chains is already present. If it wasn't, why word it that way? It's things like this that makes it so frustrating not to have the original text. Les piquenaires porteront jaquette de haubergerie à manches et plastron, au bras droit sur la maille des lames de fer à petites gardes, au bras gauche ils n’auront que la manche du haubergeon, afin de porter plus aisément la légère targe qu’ils recevront quand ils en auront besoin. The pikemen shall wear a shirt of mail with sleeves and breast, on the right arm on the mail bands of iron with small guards, on the left arm they'll only have the sleeve of the haubergeon, so as to wear more easily the light target they'll recieve when they'll need it. 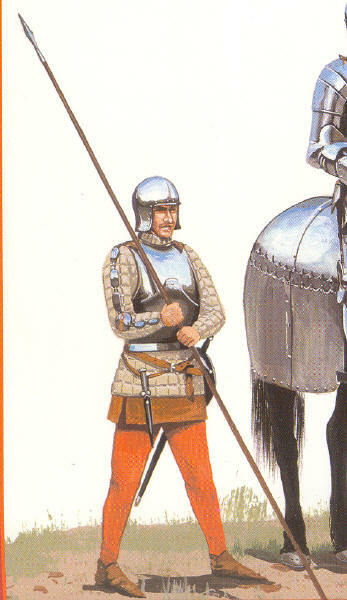 "jaquette de haubergerie" is baiscally a mail shirt - it could have been a brigandine, but this would have been stated (as it is stated otherwise for other troops), and besides, the 'manche du haubergeon" makes it even clearer. The last sentence should be understood as follows : "so that they can wear more easily whenever they need it the light target that they'll be given." Nowhere is the attachment of the target to the left hand ever mentionned. Where did you find the text of the Ordinnace? The reason I'm askign si that I've been looking for the tex of the Ordinnaces but so far has only found references to the compelte text beign published in 19th Century works whcih my inter-library loan service have been unable to find. All of them have been transcribed by Jules de la Chauvelays, and are readily available to me as I live in Dijon. That must be the book you're after, and can't get. Interesting. That bit about giving pikemen targets sounds a lot like what Fourquevaux suggested. It makes me wonder how common shields were among pikemen. Okay, this is slightly off topic, but is the other guy in the second pic doing something like Fiore's volta stabile with that pike? It very much looks like that to me. Hard to tell from the pic IMO. For what it's worth, Daniel, the Osprey book pictures you reference as being reconstructions by Breckon, after having looked at Embleton's earlier image were in fact drawn for Osprey by Embleton himself. I'm not violating forum rules by bumping an ancient thread just because it has such loads of useful information, am I? Not at all. In fact, I'll add an image that might be of use to others who find this. However I can't really tell what the pike men were wearing, could anyone tell me? It still baffles me as to how the Swiss so easily crushed the Burgundians again and again. The Burgundian army seems like the perfect late medieval army, with cannons, heavily armored archers defended by stakes and pikemen, and super-heavy cavalry. A very well-equipped combined arms force. Yet the Swiss, with just their pikemen, halberdiers, and skirmishers annihilated them so utterly that the Burgundian state ceased to exist. I've read somewhere that the Swiss had much greater morale and motivation than the Burgundians, and the Swiss do seem to have been highly motivated, but I have little idea how motivated the Burgundians were. What I heard being said a ton of times was that at neither Morat nor Grandson the military intelligence of Charles was up to date. He ordered his troops to go back to camp and eat something just before the enemy arrived, in another case he thought the vanguard of the swiss was the entire army. A combination of bad bad luck and some unfortunate or rash decisions on Charles part. His artillery trains was impressive and he even brought along a mile or so of bridge. His setup at Morat would have probably gotten him a victory if it wasn't for him making the bad call of paying the troops when the enemy arrived. Really his logistics and strategy were top notch it's just that at the last moment he threw it all away with one bad call.